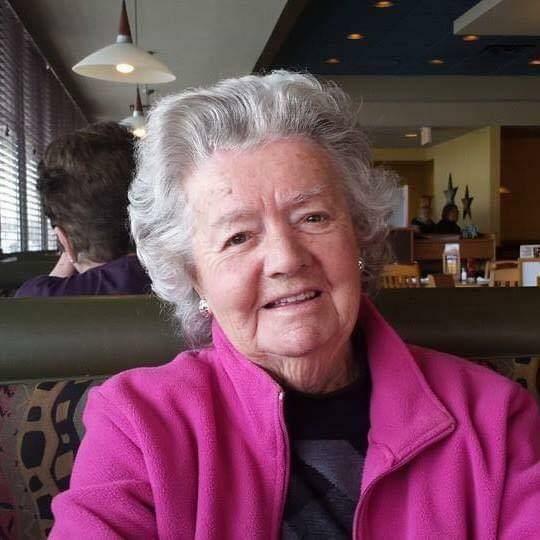 It is with great sadness that we announce the peaceful passing of Mildred Adeline Jackson age 90, beloved mother, grandmother, great-grandmother, sister and aunt, on Tuesday, December 25, 2018 at Harbourstone Enhanced Care, Sydney. Born in North Sydney, November 1, 1928, Mildred was the daughter of the late Daniel and Marion (Appleby) MacKenzie. Mom’s strong faith and love for the Lord saw her through her life right to the end. Her loving caring way was evident to all she met, she had a smile, a “hello” and a wave for everyone. She truly was as beautiful on the inside as she was on the outside. Mildred is survived by her daughter, Marion Jackson, Sydney Mines; her son, Fred (Susan) Jackson, Tupelo, Mississippi; four grandchildren, David, Stephen, Valerie and Megan; four great-grandchildren, Chauntel, Danae, Kadyn and Jack; one brother, George, Sydney; sister-in-law, Mae MacKenzie, North Sydney; also, several nieces and nephews. She was predeceased by her husband, Keith Jackson; her daughter, Heather; sister, Ethel (Elliott) Anderson; brothers, John “Jackie”, Chalmers, Dr. Gordon and Rev. Gilmour (Eleanor) MacKenzie; and sister-in-law, Mary MacKenzie. We would like to thank the staff of Harbourstone Enhanced Care. From the day Mom arrived on August 9, 2016 to her last day, she was loved and cared for. A thank you to the staff of Spanish Bay. A special thank you to Dr. Steven Hall for his care. Now, to the staff on Fisherman’s Cove, a “Thank You” doesn’t seem enough to express our gratitude for all you did for Mom and us, her family. It is never easy to watch the deterioration of a loved one’s health. But it is so comforting to know that they are receiving the love and care they deserve. The last week of Mom’s life was especially difficult. The professionalism, love, care and compassion you gave to Mom and her family will never be forgotten. God bless you all. Visitation for Mildred will be held 9:30 to 11 a.m. Monday, December 31, 2018, in the W.J. Dooley Funeral Home, 107 Pleasant St., North Sydney, immediately followed by a funeral service at 11 a.m. in the funeral home chapel with Rev. Ritchie Robinson officiating. Burial at a later date in Lakeside Cemetery, North Sydney. Memorial donations may be made to the Alzheimer Society of Nova Scotia.